Bottle episodes in animated shows don’t quite work in the same way as bottle episodes of live action shows. While live action shows utilize bottle episodes to save money and/or narrow the focus to select characters and a select moment, animated shows can utilize a single setting and still create stakes equal to or even greater than past episodes (and also, they aren’t necessarily cheaper, depending on the number of various angles and unique shots involved). Still, both live action and animated shows can use the bottle episode to pinpoint a specific moment to open up from the inside out. 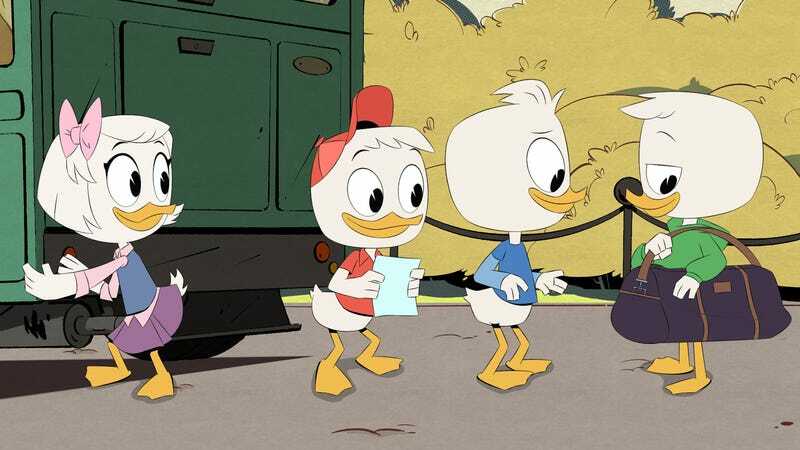 In “The Last Crash Of The Sunchaser,” DuckTales really opens up two moments–the mystery of Della Duck and the overall metacommentary of adventuring–and combines them into something deep, personal, and revealing. Just as Scrooge, the nephews, Webby, and (to a certain extent) Beakley and Launchpad find themselves functioning as a family, it all comes crashing down. "The Last Crash Of The Sunchaser!" 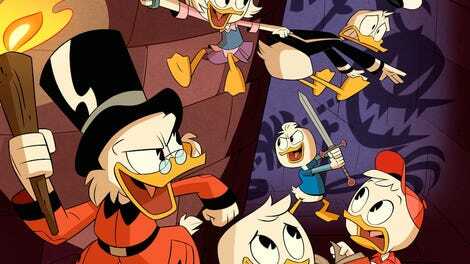 DuckTales has always tossed off its inciting incidents, but this time it’s explicit, with the entire team (sans Donald) off to Monacrow to find the Maltese MacGuffin, the ol’ nonsense item that is completely unimportant and irrelevant to the real developments that takes place on the journey to it. During the trip, the children sneak on board a number of shredded documents related to the week of their birth, which relates to the mysterious Spear of Selene. But the plane spears itself atop a sharp peak of a random mountain, a piece goes floating around, which Dewey chases after obsessively. It’s a bit of a stretch to buy: it’s a comedy-of-errors-type scenario in which every possible obstacle gets in the way of just grabbing a (constantly size shifting) paper scrap. But it works, mostly because the swaying plane makes every choice and obstacle more dramatic and dangerous. Also while I get the idea behind not telling Scrooge or any of the adults what they’re up to (they’re worried they will shut down their quest to find the truth), it’s kind of hard to really buy that none of the kids would explain themselves sooner. Maybe it’s because Scrooge, Beakley, and Launchpad are too wrapped up in their own concerns. The throughline through these adults touch upon the metacommentary of adventuring that the show was doing earlier in the season, with Mrs. Beakley shocked to discover that the kind of adventures that Scrooge have been taking the kids on were way more dangerous and freeballing than she expected. (This is also a stretch. Beakley trains her daughter for all sorts of dangers, and she has to have had some idea of the past shenanigans of previous episodes. It’s odd to have her suddenly act so deeply concerned about everything, even if it kind of makes sense of her character, who has been a stickler of rules since her secret agent days. So yeah, her being upset that the plane has numerous violations and at Scrooge’s cavalier attitude makes sense, but not in the context of an entire season of her never bringing any of this up! But I digress). The core of the argument between Scrooge and Beakley is her trying to convince Scrooge he is out of his element and is in a scenario he can’t control, that he can’t adventure his way out of to protect his family. Scrooge has been getting away with his behavior partly because he’s rich, and partly because he himself has bought into the hype of BEING SCROOGE MCDUCK. The show has used that to kind of paper over thin storylines and dramatic beats in kind of an ironic way, but here, it’s deeply personal and revealing. And terrifying. As the dangers mount, Scrooge gradually let slip moments that reflect what happened between Della years ago. I like that as Scrooge loses more control of the situation the more he flashbacks to those moments, and eventually closes everyone out instead of showing his flaws and vulnerablility. Louie, who is usually calm and collected when it comes to scams and the gift of gab, seems most affected by everything that is revealed. It’s clear that he is struggling the most with all this. With one episode left, I can’t really imagine the show exploring that in any real depth, but maybe it’ll be worth exploring in season two. While I love the show’s awareness of Dewey milking those “nothing can stop us” moments as time-wasters, they still were time-wasters.